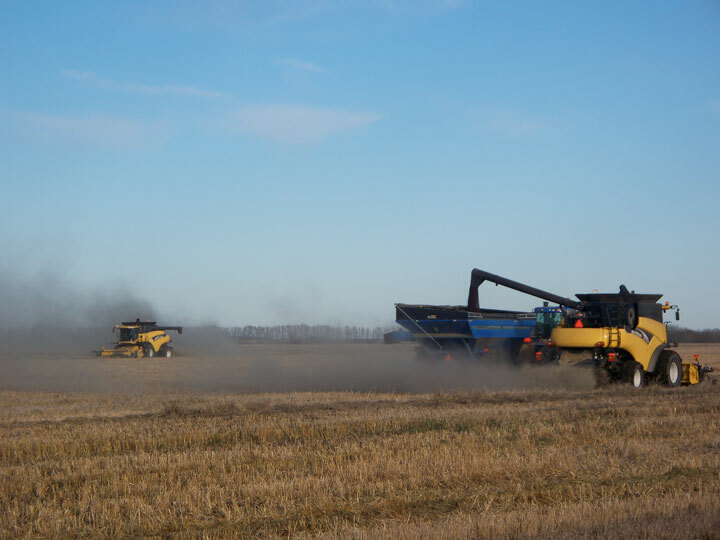 These combines were photographed this afternoon north and north east of Tisdale between 2:30 and 3:30. The first one I spotted was this (right) John Deere just two miles north on #35 and as you can see that was a dry field with little mud on his wheels and he was able to move right along on the swathes. 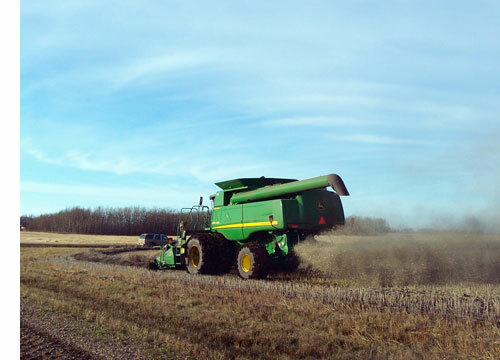 I turned east and there were combines in all but a couple of unharvested fields. 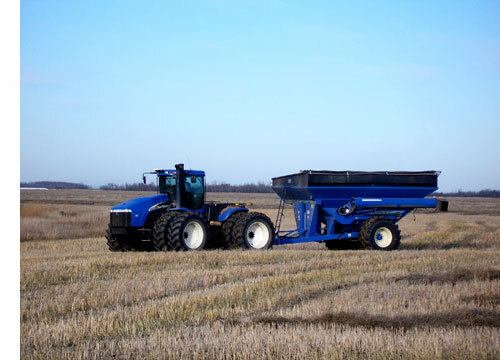 The one you see below was one of two working in that field with a grain tank pulled by a tractor and a semi patiently waiting on the road. This field was to wet for the semi to venture into the field, in fact most of the fields I saw were to wet for me to take a chance and drive the van off the road. 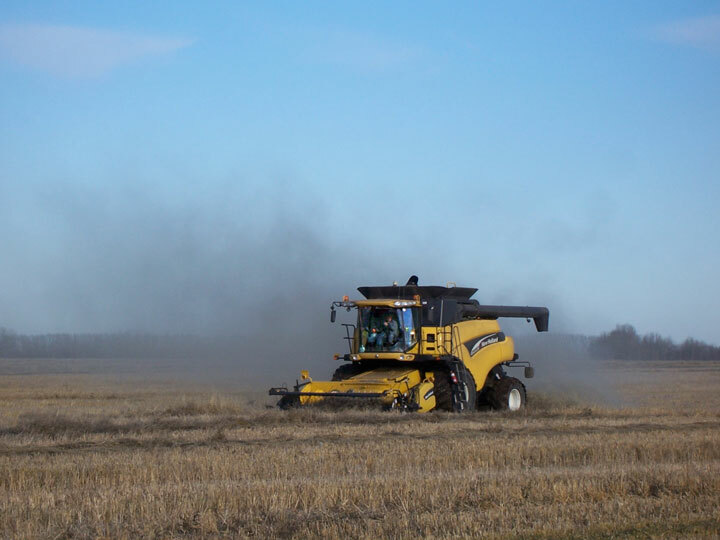 In this operation the swathes were not as heavy as others and the two combines were moving right along having no problems and as you can see producing a good deal of dust as they were working through the field. It was interesting to see the coal black Canola seed pouring into the grain tank (below). This is the same combine and since it was not far from the road I was able to roll along at the same pace to capture this image. There were two more fields just to the south of this operation with John Deeres in each field. The one below was working in very heavy swath and was just creeping along and you can see the mud loaded up on his wheels. 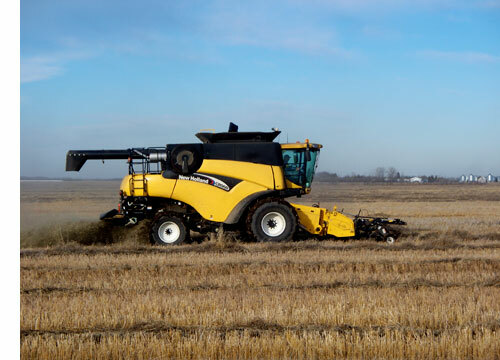 I did not see any combines in the fields with cereal crops even though there are still some unharvested. 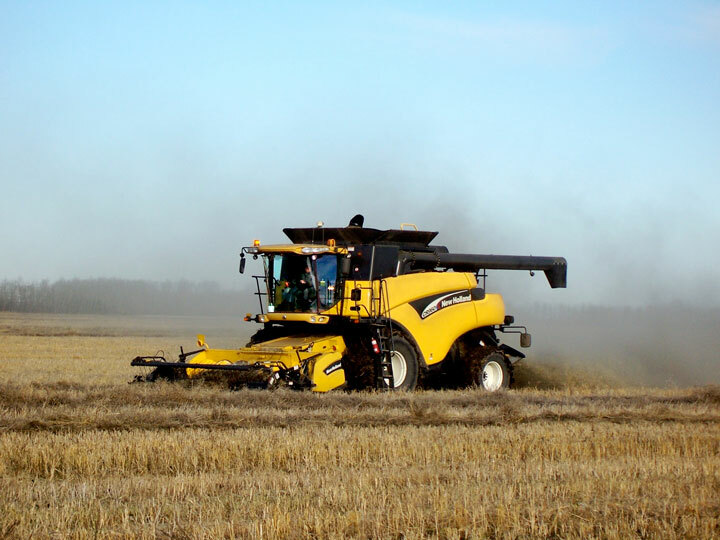 Each of the combines I saw were in Canola. 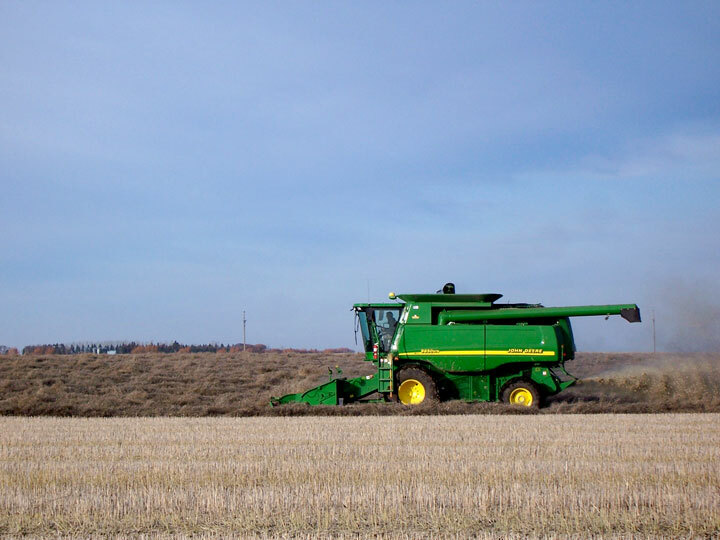 This is another field with another John Deere and you can see in both pictures he has been working through the mud. 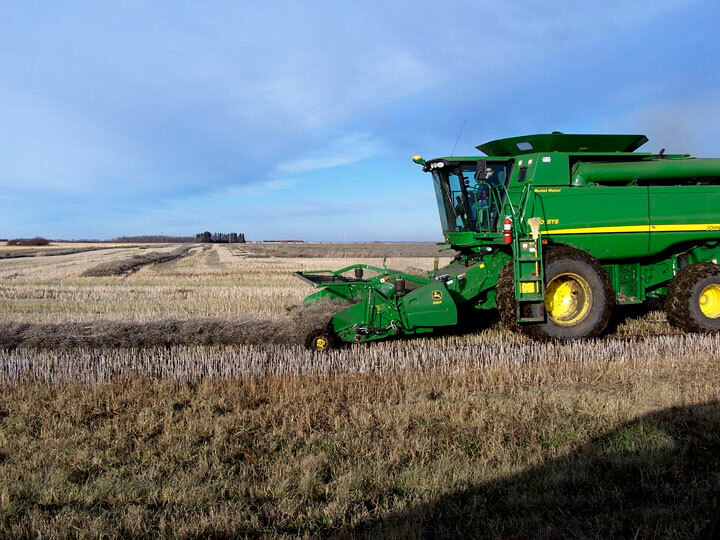 At this point every little bit harvested is like money in the bank because winter will take a heavy toll on what crops do not make it to the bin. The weather reports suggest that we can have more sun Tuesday and Wednesday but things are looking wet on Thursday. 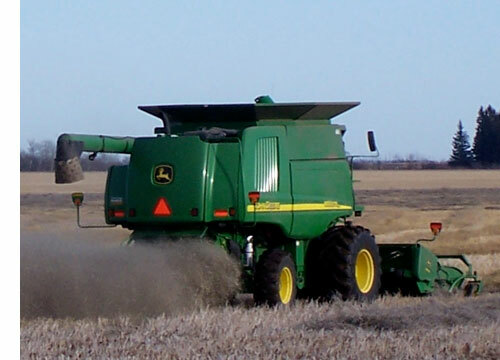 There is no doubt these and other combines worked long after dark or until it was just to wet to keep on running.